Winning campaigners share five ways they are using collective identity, experimentation and even layer cakes to boost and scale member engagement. What does people power really look like in the day to day work of building and running campaigns? I had the privilege of exploring how several winning campaigners are engaging people and building power last month at Blueprint for a Great Democracy, hosted by Common Cause: Greisa Martinez (Advocacy Director at United We Dream Network), Ruth Martin (Senior Campaign Director at MomsRising) and Anastasia Khoo (Chief Marketing Officer at Human Rights Campaign). Here are my five key insights from campaigners at the session. Read on to hear more about how panelists apply these principles in their work (video of the full session is embedded below). Collective identity leads to collective action. Organisations focused on deep engagement and building people power have systems, tools and language that reflect this commitment. Be human: Welcome, thank, and acknowledge people at all levels. People can bring exponentially more resources and skills to your campaign than staff alone. Experiment, evaluate – and know when to simply let your people go for it. Identifying with a movement isn’t just symbolism – it can be a powerful catalyst for action. Greisa Martinez spoke about how the United We Dream Network coordinates large coming out events where people speak openly, often for the first time, about their status as undocumented immigrants in the U.S. These events show participants that there are many others like them, making action easier (and safer). They also show friends, family and even strangers that the undocumented are people just like them. MomsRising places an emphasis on stories and shared values: “Being a mom is a shared experience that cuts across economics, race and geography,” Ruth Martin said. 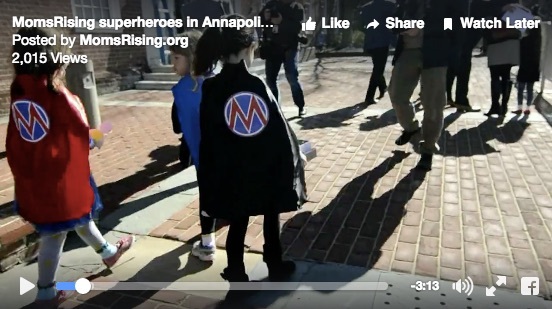 MomsRising is bringing parents and their superheroes to state capitols in the fight for paid leave. They offer a “layer cake” of ways people can get involved and strive to deeply support every member’s action. 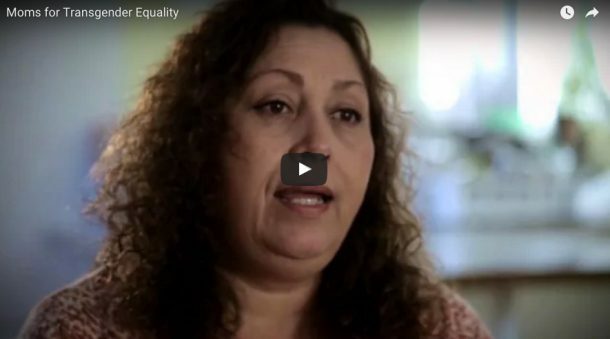 Anastasia Khoo highlighted HRC’s experience elevating shared human values in a recent campaign that includes video of moms talking about the hope, love and worries they have for their transgender children. Listening to a mom speak emotionally about her child can be far more moving to legislators (or other moms) than any lobbyist’s testimony. Human Rights Campaign launched “Moms for Transgender Equality” in late-2015. The project includes interviews with moms raising transgender children. Find out more. Leave it to organizers and communicators to create methodologies and syntaxes for their engagement strategies. United We Dream uses dating as a metaphor for engagement. Some people are just “hanging out” together. Others are ready for a serious relationship. And, just like dating, meeting new people is key. Martinez spoke about meeting in person with questions like: Who are our people? What do they want? What’s their vision for future? Where are they? “We figure out how to meet our people where they are, so we go to churches, colleges and ethnic markets,” she said. Martin also pointed out the need to be creative about tracking support. Effective engagement isn’t just about counting petition signatures or event attendees. MomsRising has found some of their best activists and volunteers by reading emails they received or the customized letters people sent via online petition tools. Digging a little deeper through the emails and Facebook comments that most groups ignore can surface some of the most caring and active new faces. Human Rights Campaign also runs a robust, multi-layered system to recruit and manage volunteers, according to Khoo. 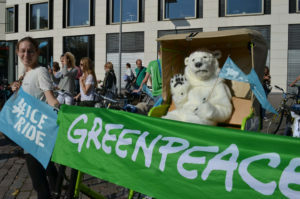 There’s no doubt that really reading and responding to emails, Facebook comments and tweets can take time but, as every one of the campaigners here noted, real engagement can’t be fully automated. Everyone talked about treating supporters like staff. Ruth Martin referred to the “aggressively welcoming rainbow” of ways her group acknowledges activists and new supporters. In addition to reading and responding to emails and Facebook comments, MomsRising has sent flowers to people who showed up at public hearings and shared perks meant for staff (e.g. opportunities to visit the White House). What role do people truly play in our work? This is an especially important question for NGOs that believe (or claim) that people power is essential to fulfilling our missions. Anastasia Khoo of Human Rights Campaign spoke about not just inviting people be part of a community but also providing ways for people to declare their support. Putting an HRC bumper sticker on a car or changing one’s Facebook profile photo with a pride flag filter lets people self-identify with the LGBTQ community. “It’s a political act,” Khoo said. It tells people that “…you’re not just part of a community but you support the community.” These acts can impact campaigns on the ground, too. I’m struck by how many organizations see engagement as a single-step effort rather than the beginning of a chain reaction. How can we better empower people to engage their own communities and networks? Think expansively, and don’t be limited by the scarcity of your budget and staff. Each person you reach is connected to others. There’s a lot of talk (including our own) about testing and metrics in digital campaigning and engagement. Panelists spoke about avoiding the temptation to test for the sake of testing and reminded us to instead focus on building a culture of learning in which everyone can understand and value a full cycle of testing and learning. Ruth Martin described “Metrics Mondays” at MomsRising. Everyone gathers for a recap of what’s been tested, talks through the numbers, and shares results. The what, when, why and how of testing becomes transparent. “Everyone gets to know what works and doesn’t,” Martin said. 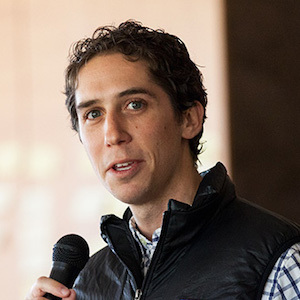 Human Rights Campaign has used testing and learning to support rapid response. “We are accustomed to a rapid response culture,” Khoo said. “Execute and shift. Execute and shift. We have a very tight culture around approval processes that has response down to 90 minutes. We don’t talk, we just do it.” This is a system driven by testing and learning, Khoo says, but one that needs leadership that embraces a culture that empowers staff to act. Thank you to Jesse Littlewood, Director of Digital at Common Cause, for organising us and bringing so many smart people together to talk about how to create change. 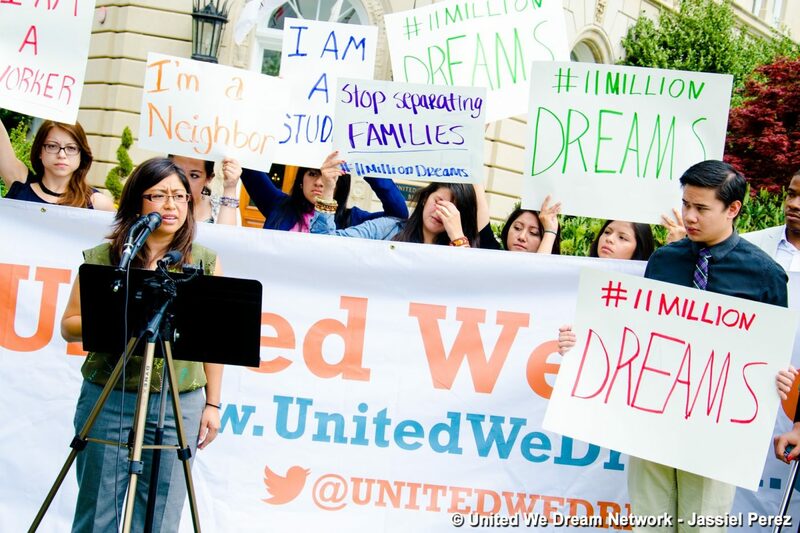 Top photo: A United We Dream press conference in Washington, DC. Photo © United We Dream Network/Jassiel Perez.